The subconscious yet contagious impact of a beautiful smile is radiant health, happiness, warmth and invitation. A “Smile Makeover,” a common household term for many Americans today, is designed to enhance the esthetic and functional aspects of teeth through cosmetic and restorative dental procedures leaving one with a brighter, whiter, more youthful smile. In the overall context of the face, it's the eyes and smile that speak to us. When you smile they both light up. Americans are catching on to the emotional and social importance of a healthy, beautiful smile, and they're seeking out ways to improve their smiles. 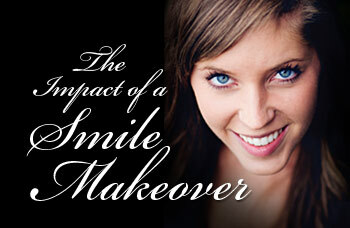 It's not only the rich and famous looking for a smile makeover. According to the largest organization devoted to smile enhancement dentistry, the American Academy of Cosmetic Dentistry, over 70% of clinical inquiries about cosmetic dentistry come from those in the 31-50 age group — including not only people in family situations and the workforce who want to improve their social and business interactions, but also individuals who just simply want to feel better about themselves. First impressions are not only important; they often last the longest. There is no doubt that among people suffering from poor self-image, dental concerns rank among the highest. Smiling, one of humanity's most innate and in-borne natural expressions, is inhibited when it's not all it can be. Raising the curtain on the theatre of a smile sets the stage before the show even starts. When the curtain goes up and teeth are discolored, missing, or misaligned, it may be a show stopper right there. It really doesn't matter if it is a serious defect or a slight imperfection — if a person is self-conscious about their smile, it can exact an emotional toll and adversely affect interactions with others. The greatest effect, of course, is within the person himself or herself — YOU — and often it doesn't end there. Far from being “just in your mind,” an inhibited smile may also affect others' perceptions of you. Friendships and family relations can suffer; dental appearance can even determine who we allow ourselves to fall in love with. Careers can be affected by dental imperfections; those interviewing for jobs and for those whose jobs depend on networking, the self-consciousness of a poor smile can limit a career. Our own feelings of being free and outgoing become stifled. We become aware that we are not as happy as we could be. We then limit our possibilities we have in the world and our future does not look as rosy as it once did. In 1999, scientists from a variety of disciplines, including zoology and economics, put this idea to the test. Over one hundred subjects participated in a game with the object of making a simple “one-shot” bargaining deal (based on trust) with another participant whom they had not met. They had, however, seen photos of the other contestants — under controlled conditions — of either their bargaining partner smiling or not smiling. The results lent support to the idea that game partners previously viewed as smiling had a greater chance of eliciting trust and completing the bargain.